Intelligent Gas Alarm offers world-class solutions and products from German manufactuers - Fischer mess technik and Jola for liquid level monitoring for float switches, continuous monitoring for water, liquid, sewage, diesel, chemical, spirit, petrochemicals, waste water etc for safe and hazardous area with ATEX, ICE, Ex certifications. We supply these products to companies like GNFC, NTPC, BHEL, LNT MHI, Green Valliey etc. 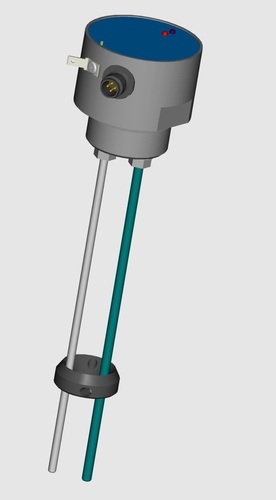 Installation: The NC56 Capacitive Level Sensor is installed vertically downward at the top of the vessel in which liquid level is to be measured. It is fitted into a G1¼-F threaded socket, located as close as possible to the center of the tank. The lower ends of the rods must be at least 10 mm above the tank bottom to avoid contact with any sludge that may be present. The electrode rods can be cut at site to a shorter length, if required, but must be of equal length. Measuring probe of NB10 is designed around a highly sensitive pressure sensor with a silicon membrane-measuring element. NC57 can be applied to metal tanks and configured for measuring level in ranges from 400 to 2000 mm. Installation: The NC57 Capacitive Level Sensor is installed vertically downward at the top of the vessel in which liquid level is to be measured. It is fitted into a G½ resp. G1 threaded socket. Thereby an electroconductive connection between the wall of the tank and the connective thread must be ensured. The lower end of the rod must be at least 10 mm above the tank bottom to avoid contact with any sludge that may be present.